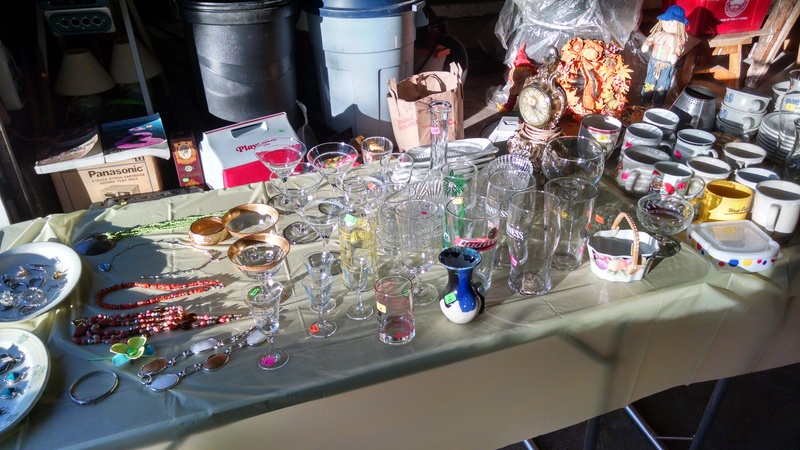 Just a short post today, as I get ready to help my mom prepare for her giant yard sale tomorrow. Thankfully, Mom is in good health and is downsizing from the three-bedroom home where my brothers and I grew up to a really lovely, much more modern condo. She’s not moving very far either, so she won’t have to say goodbye to any dear local friends. In fact, the condo is only about a mile from the old neighborhood, so even the neighbors she’s come to love and trust won’t be far from her. Oh, and many, many of her friends also live in the complex she’s moving into. So this is—as much as any major move can be—a happy change in her life. A positive thing. And yet, there’s a sadness—often unspoken—about the whole thing too. The house she’s selling is the first and only one she ever bought with my dad, who died fourteen years ago. And although most of Dad’s clothing and personal items have been donated or given to people who wanted them, his gentle presence still inhabits the home, and whenever I go there, I sense it strongly, as well as his absence. Today, then, my kids and I are headed up there to start going through the things she won’t be able to bring to the condo. Things that fall into the category of “not good or important enough to keep but not trash either.” We’ll put price tags on the dishes and drinking glasses we used as kids, old Halloween costumes, and the curtains and furniture that gave that home its character for so many years. My daughter asked if it’ll make me cry to do that, and I told her that I hope not. They’re all just things, after all, things that will most likely get used by other families much like ours. Memories are in your heart, I tell my kids, and my mom. And I firmly believe that. Possessions are nothing, in the scheme of things. I’ve had yard sales before too. Several years ago–when we were certain we wouldn’t have any more babies–my husband and I hauled all but the most precious baby stuff out on the front lawn and spent a lovely day watching people younger than us find treasures in the items that we no longer had use for. We thought it might be hard seeing our old Pack ‘n’ Play get taken away by strangers, or our kids’ favorite ride-around toys and mobiles go off with other people, but in the end, it didn’t really bother us. Actually, it made us happy to see other people so happy to get what they wanted at bargain prices. So I hope this sale will have the same vibe. The weather tomorrow is supposed to be beautiful, so that will help. But will I shed a tear or two when I see new people buying my dad’s old tools? Or his lawn mower? Will I cry when people walk off with boxes of my brother’s record albums, or the board games I used to play on the porch with friends on rainy days? This entry was posted in life, life events, Uncategorized and tagged aging, life, parents, yard sale. Bookmark the permalink. Having just gone through that with my mother (48 cubic feet of unsellable stuff given to the junk man!) I don’t envy you! Except a rough day and it probably won’t be as bad as you think and definitely reward yourself later! Oh, Jan, I’m sorry about your experience. We spent most of today trying to sell stuff, and will be back to it tomorrow morning. After that, it’s all going to charity/the junkman. And you’re right–at least today wasn’t too bad, all told. A couple of strange experiences, though. I’ll make sure to get another blog post up soon. Bittersweet life events. I look forward to your post next week. I am preparing to do the same, but in my case, Mom passed away and so I anticipate a melancholy event when we gather to go through and separate Mom’s all that was her life. I’m thinking about you and your task at hand, Mary. Oh, D.B., I’m so sorry about your Mom. I recall getting together with my mom & brothers after my dad died to figure out what to do with all his stuff. It wasn’t easy at all, and sadly, a lot of it is still at my mom’s home–which is being sold now–so we’re finally going to have to deal with the things we didn’t want to confront before. As Bob Dylan supposedly once said after losing a friend, “Death don’t mix with life.” My heart goes out to you as you move forward, and I wish you strength and light. Really beautiful post, Mary. I find it so hard to part with “things” even though I know they are just things. I say, shed a tear if you need to, grieve a little if that’s what you’re feeling, and then celebrate the new memories waiting to be made. xo! hmmm… I was crying and I don’t even know your Mom! Great post. Life transitions can be emotional, even when they’re happy ones! Aww, Carrie. You’re so sweet. It really wasn’t that bad, and my mom is doing really well with the moving thing so far. It’ll be a big deal when she actually moves out of the house, but thankfully, she’ll be among friends at her new place. I think that’ll really help all of us. but always had difficulty going to estate sales. I know what you mean about having to sell off your parents things. My mother in law passed in 2010 and I will never forget the feeling I had when my husband and I have to remove and donate all her belongings from her home. We then sat and sold off piece by piece of things that were very special to her. I didn’t want to do an estate sale as I had previously been to a few and watched strangers rummaging through the deceased personal belongings. My husband and I just had to leave. I felt vibes in the homes and I was distressed that the people running the sale were basically letting people make a mess in closets full of clothing. I would never let that happen. There is a story behind every piece only known to some. Those stories are what we remember and treasure. I hope your mother will be very happy in her new condo. She must be very proud of you, your success and talent in writing. Best wishes! Thank you, Marnie! I’m so sorry about your mother-in-law, and that you had that experience. And I know what you mean about estate sales. I went to one a long time ago and felt extremely uncomfortable there. The sale at my mom’s wasn’t really all that bad, as we were outside, and neighbors kept coming by to chat. Thank you for the kind wishes for my mom. I’ve had two yard sales in my life. Not my cup of tea to say the least, though the shoppers antics could be mined for character inspiration in short stories 😉 I love getting rid of stuff though and probably err on the side of giving away things too quickly to Goodwill. I’m the complete opposite of a pack rat. Thank you, Jeri! I totally agree about the yard sale customers–we had a number of very interesting ones! As for clutter, I feel like I fight a constant battle with it. No matter how many times I/we clean out the place, more stuff seems to accumulate almost immediately. Thankfully, there’s a Goodwill depository near our house for when things get out of control.